There are great silences in the morning. All is quiet. The only sounds to be heard are the dishwasher combing the spaghetti stained plates, the thumping of a moon shaped clock, and the dribbling of May showers on the porch. The rain has been courting the gardens, and bouncing off of the pavement all week. Although rain is all around, and fog covers the mighty sun, I have photographs for you when the sun's color brightened my feet. 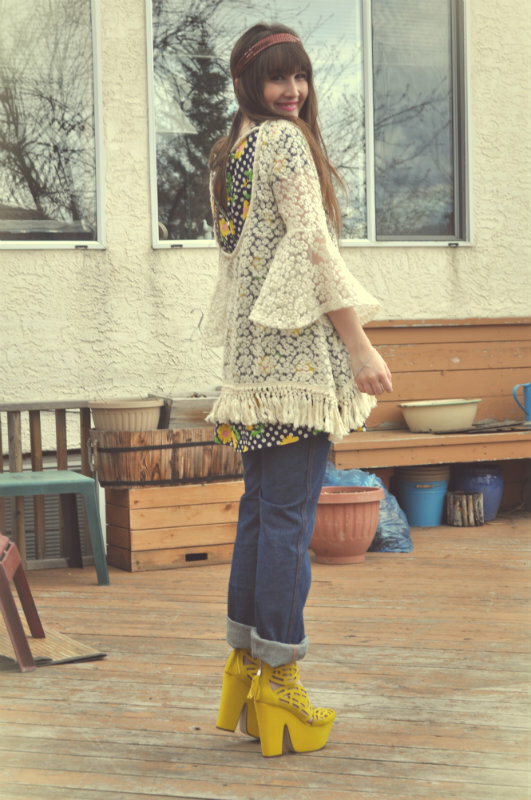 These yellow platforms were sent from Lulu*s, they are mighty and brave like a lion's mane. Yet, the color reminds me of a small and yellow perching bird, the canary. The white sheer tunic was also gifted from Lulu*s, and I patiently wait to be a beach goer, wearing a bathing suit below the little white flowers. This particular outfit was so comfortable, I could sleep below shady groves wearing it. I recently had a darling little interview/feature on Binzento Vincente, The feature is filled with generous words and photographs that haven't been posted here yet. I chirped with Vincent over coffee, and found him to be such a gentleman! 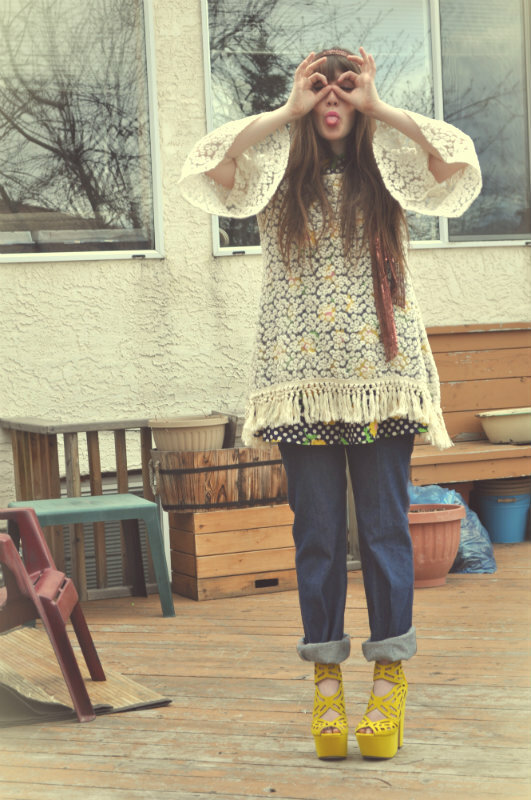 I was particularly teary-eyed with these kind words "I realized that Flying a Kite blog was more than just a product of fashion experimentation by Amy, its also taught us lessons to love our mother nature by recycling, and that good fashion is timeless." Now I'm off to sandwich some raspberry jam between two slices of toast, and then I'll stir a cup of hot chocolate and be on with my day. So cute, and congrats on the feature! Love the white top!! 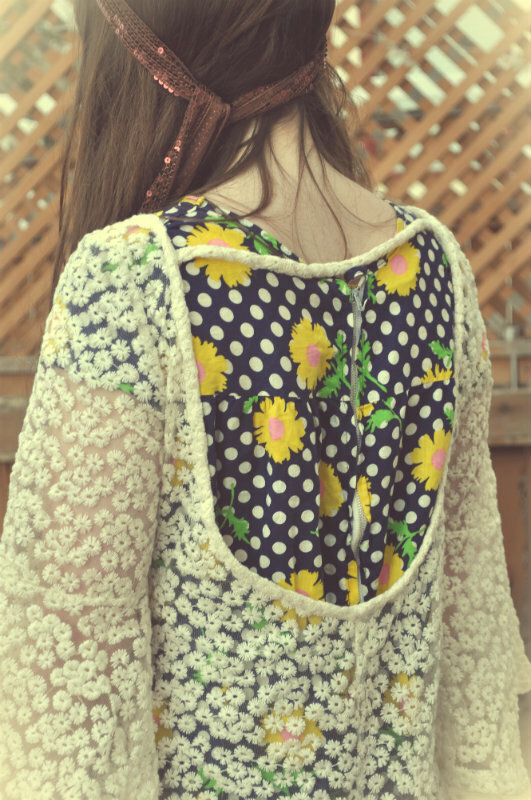 Love it's sheerness and how you put the sunflowers under it!! Gosh, I cannot get over the fabulousness of these shoes. so psychedelic & lovely. 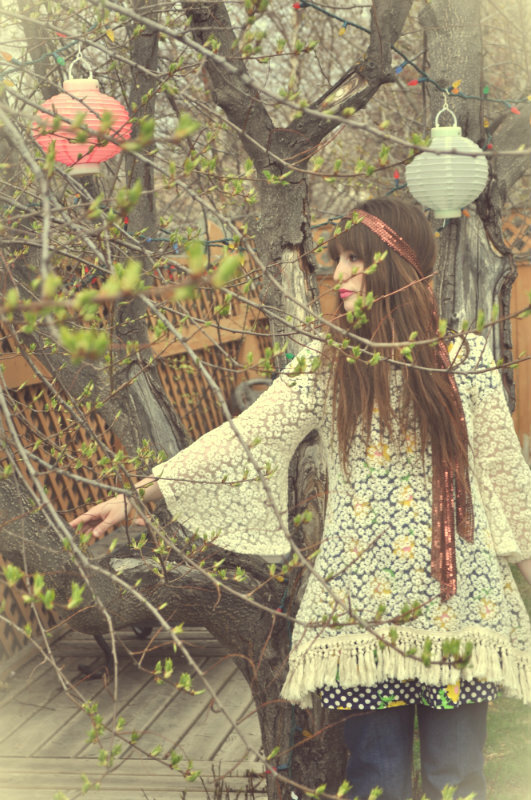 you're just a gypsy dream, lady! 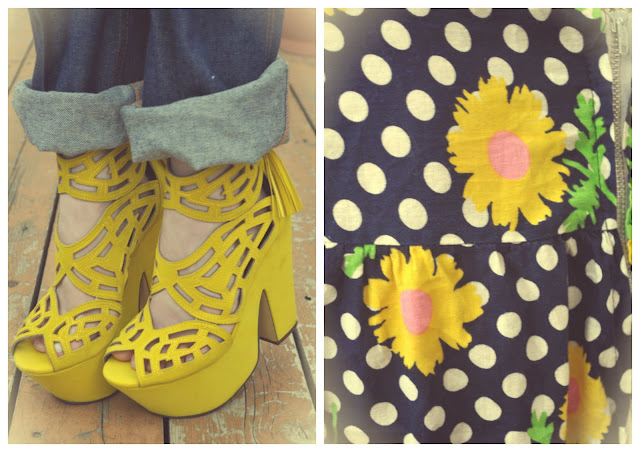 i truly can't get over those amazing, chunky, gorgeous yellow heels. if they ever need a home...just sayin'. congratulations on the feature and loving how retro this look is! Holy moly those are some bright shoes. Me likey! amy, do NOT get the pliers! please, oh please. however, you can continue writing poems & hyperboles, wearing canary yellow shoes, & dancing in the fog, like a flower child. oh. my. god. i'm in love with those shoes, they are to die for! 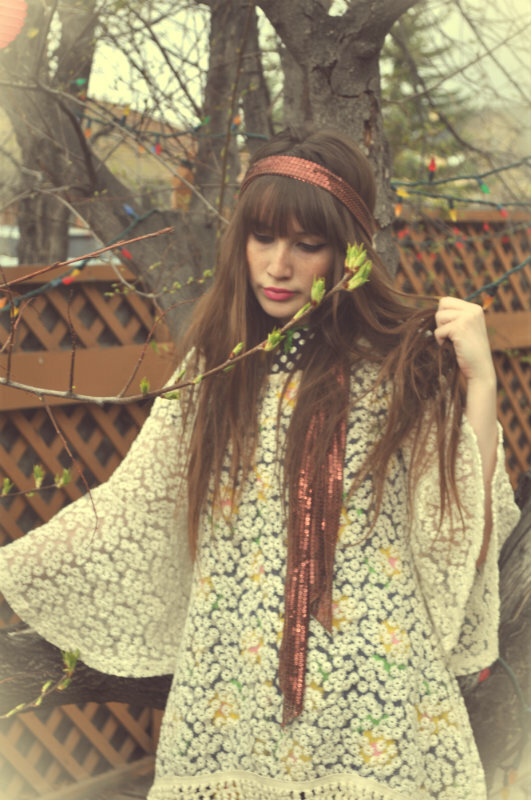 Your tunic is gorgeous! Love the photographs too, so pretty. I hope the teeth get better soon, wisdom teeth are such a pain! Such pretty pictures. 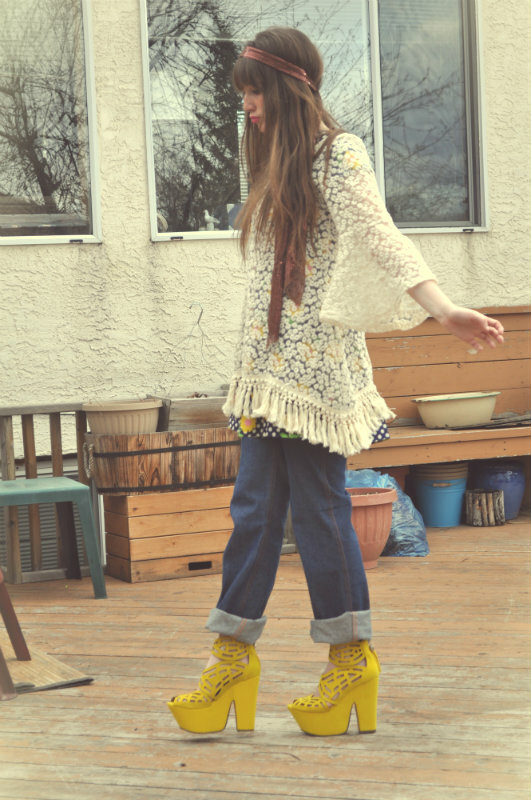 Your yellow platforms are so incredibly cool! Such a statement shoe. Also, I'm sorry about your wisdom teeth! I absolutely love that dress! Beautiful! 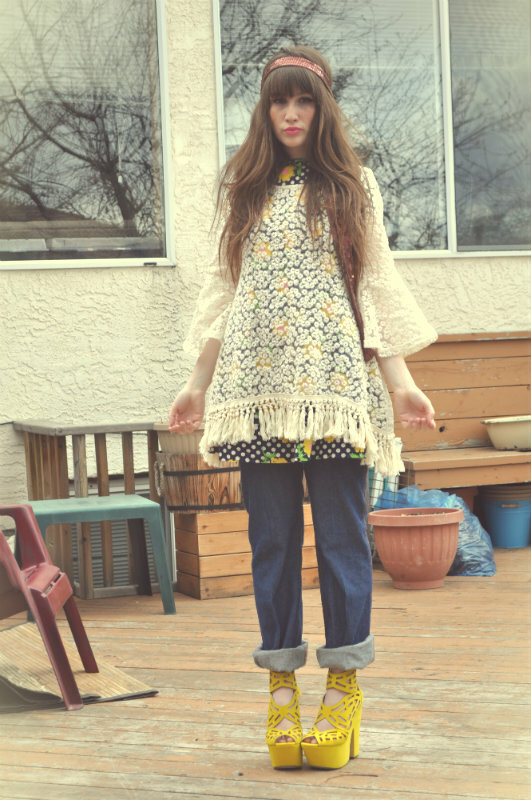 I am in love with this outfit! 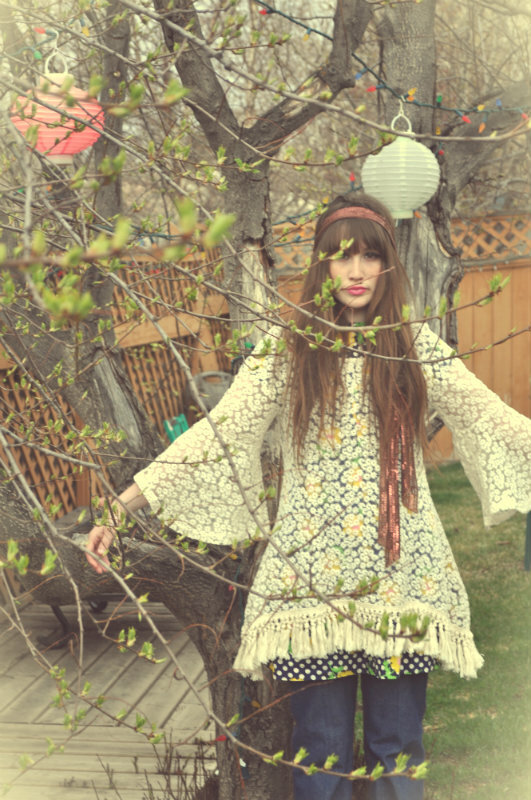 that tunic is amazing esp over the sunflower dress! you look stunning. 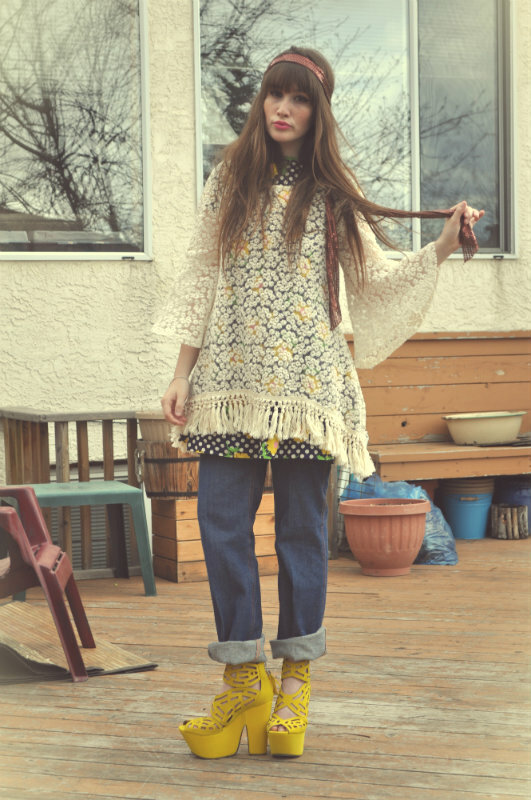 Just stumbled upon your blog and I have to say that this outfit is oh so fabulous, amazing yet casual and cozy. I totally love it! Talk about Walking On Sunshine :) Love it! you did a great job styling the look.